Repurposed pallet projects are one of my favorite DIY projects. Wood pallets are commonly use as a mechanism for shipping and storing larger items. But recently, they have become so popular as a useful resource in making impressive furniture and decors for your home and garden. If you are looking for creative ideas to repurpose pallets into cool pieces of furniture, here is an awesome DIY project for you. In this tutorial, YouTube channel kipkay is going to show us how to build a pallet swing bed. It is very easy to make from two pieces of pallets and requires very little time and skills. It will be a wonderful feature to add to your garden this summer. Nothing is more relaxing than lying on the swing bed and enjoying the breeze during a lazy summer day. I could spend a whole afternoon or evening there. How about you? Follow the video and learn how to build one of these cool DIY pallet swing beds! 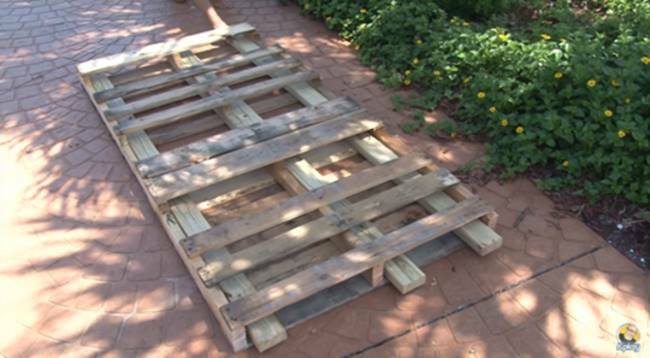 Don’t forget to share this awesome DIY pallet project with your friends and family!